I attended two very different British films at the Pacific Film Archive Sunday. They were not a double bill. I’d seen this 1948 Technicolor backstage ballet drama in the 1970’s, and didn’t care for it then. But it’s considered a classic and has recently been restored, and I felt it was time to give it another chance. This time around, I still saw the flaws that turned me off long ago, but I was also more aware of its considerable strengths. For one thing, it’s one of the most expressively beautiful color movies ever made. (The PFA screened it as part of a series on the Technicolor work of cinematographer Jack Cardiff.) The outdoor European locations and lush interiors dazzled, while the rehearsal halls somehow managed to be lovely while looking completely utilitarian. But it was in the dance numbers—where expressionistic colors were utterly realistic—where Cardiff’s art shined most. 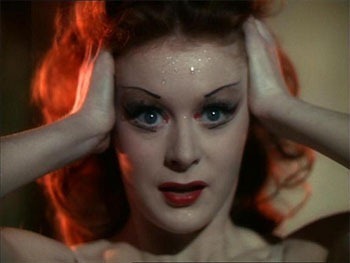 There’s a close-up of Moira Shearer’s eyes where her red stage makeup makes her surprise all the more effective. The story by directors Michael Powell and Emeric Pressburger is slight during the first half. But the characters, all fanatically devoted to their art, make up for it. At the center is the dictatorial ballet director played by Anton Walbrook, who expects nothing but absolute devotion. Two promising young talents–Marius Goring as a composer and Shearer as a dancer—try to win his confidence and make their name. This is very much a film about the sacrifices people make for art. 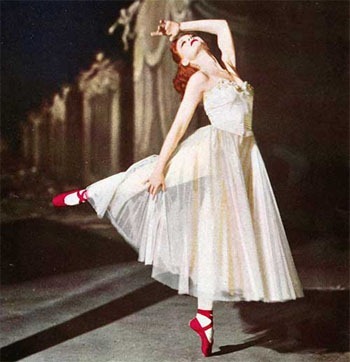 The film’s centerpiece is the Red Shoes ballet, based on a story by Hans Christian Andersen. Lasting about 20 minutes, it tells the Andersen story (which we’ve already been told in dialog) in a way that’s thrilling, romantic, and terrifying. The dance is supposed to be taking place on a stage, but like many old Hollywood musicals, it doesn’t limit itself to what could actually happen in live performance. At first, I had a harder time suspending disbelief than I would in a less serious film, but not not for long. I soon realized that the visuals had has much to do with what was happening in the dancer’s head as on stage. Unfortunately, the movie runs for nearly an hour after the dance, and it’s all anti-climatic from there. It’s also melodramatic. Powell and Pressburger must have decided they finally needed a plot, and they picked a clichéd and unbelievable one. A major letdown. The Red Shoes has gone through a big restoration, and it shows. The colors were incredible. But the restoration wasn’t perfect. While the close-ups were sharp, long shots were often a bit soft. Maybe that was intentional. One more thing: A large, organized group of students attended this screening, and most of them came quickly into the auditorium at the last minute. That might have been intentional—the movie begins with a crowd of students running into a theater to take their seats. I never heard of this 1964 Joseph Losey anti-war drama until I read about it in the PFA schedule (it’s part of a Losey series). That’s a shame. This is a masterpiece that should be studied in film classes. Set entirely in the trenches of World War I, it follows the quick, pre-determined trial of a soldier arrested for desertion. Based on a stage play (and that based on a short story) and shot on a very low budget, the film is quick, direct, and dialog- heavy. But it never feels stage-bound. Thank the squalor for that. Losey creates a world of dampness and mud. There’s a dead mule with a belly full of rats, and constant, never-ending gunfire in the background. And of course, the knowledge on everyone’s part that at some point or other, you’re going to have to seek that gunfire or it will have to seek you. Either way, your chances of returning to normal life are small, even if you’re not awaiting trial for a capital crime. Dirk Bogarde gets top billing as the officer assigned the impossible task of defending a man who is pre-condemned. 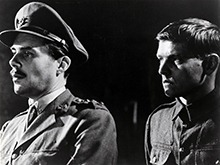 But the more fascinating performance came from a young Tom Courtenay as the not-too-bright prisoner who doesn’t quite realize how bad his situation is. The print was not, as the program promised, from the PFA collection. It turned out to be something more unique—a fine grain master made off of the original camera negative and intended for making dupe negatives. It lacked some of the contrast you’d find in a print made for projection, but it was as sharp as a tack. King and Country will screen at the PFA again on Thursday, at 7:30.